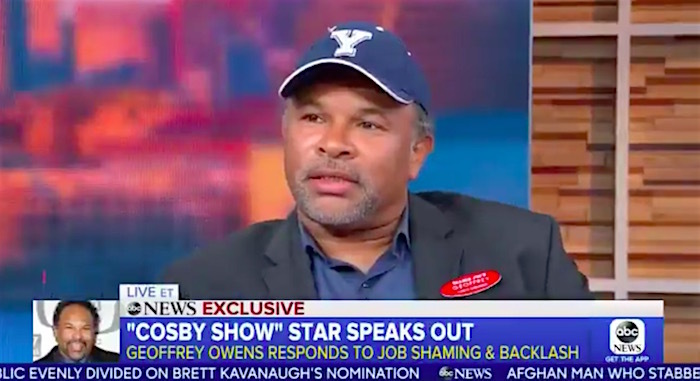 Over the weekend, a shopper at Trader Joes spotted former Cosby Show actor Geoffrey Owens working at the grocery store. She took photos of Owens (who played the young doctor Elvin Tibideaux), which the Daily Mail and Fox News immediately pounced on, job-shaming the actor in before-and-after tabloid-style stories. Owens went on Good Morning America this morning, where he said, "There's no job better than another...every job is worthwhile..." He said he was devastated by the job-shaming at first, but then became overwhelmed by all of the support he received online. One of his supporters was filmmaker Tyler Perry, who offered him a job via Twitter. "I'm about to start shooting OWN's number one drama next week! Come join us!!! I have so much respect for people who hustle between gigs. The measure of a true artist." Another supporter was Harry Potter star Chris Rankin, who shared his own experience of working in a kitchen in between acting jobs. "I worked in a Wetherspoons kitchen after being in Harry Potter. I needed a job, no shame in that. And you know what? I really liked it! You do what you need to do and that's nothing to be ashamed of." Owens is grateful for his defenders, and he's also grateful for his career. His parting words on Good Morning America: "No one should feel sorry for me... I've had a great life. I've had a great career... So no one has to feel sorry for me. I'm doing fine."